Ada pertanyaan untuk Family Transit Hotel? Terletak di pusat Bandara Noi Bai, Family Transit Hotel adalah tempat ideal untuk menelusuri Hanoi. Pusat kota terletak hanya sekitar 22 km dan bandara dapat ditempuh dalam waktu 4 menit. Dengan lokasinya yang strategis, hotel ini menawarkan akses mudah ke destinasi yang wajib dikunjungi di kota ini. Family Transit Hotel menawarkan pelayanan sempurna dan segala fasilitas penting untuk memanjakan para wisatawan. Hotel ini menyediakan akses ke sejumlah pelayanan, termasuk layanan kamar 24 jam, WiFi gratis di semua kamar, satpam 24 jam, toko serbaguna, layanan kebersihan harian. Hotel ini memiliki 15 kamar yang didesain dengan indah. Banyak kamar memiliki loker, ruang penyimpanan pakaian, handuk, rak pakaian, sandal. Disamping itu, hotel memiliki berbagai pilihan fasilitas rekreasi yang menjamin Anda melakukan bermacam hal selama menginap. Nikmati pelayanan tidak terbandingkan dan penginapan yang sungguh bergengsi di Family Transit Hotel. We had a miscommunication with the manager about the arrival time... but he was kind enough to offer another room from a nearby hostel Sao Mai (which is also a great one). We transferred to our booked room the next day. The staffs are great. Very welcoming. The room is very clean. I love the view from the window, especially at night. They had free bathroom necessities, hot/cold shower (awesome) and serves delicious food. There's fridge and TV in the room. Wifi is very fast. It's quite far from the city but they also offer transportation services, so it's still great. transportation to the city. It's very near the airport so going to and fro is not a problem. Friendly staff who picked us up on time. The toilet is not clean with urine stain in the triple room we booked. The sink is leaking water in the other double room. The person who arranged taxi to pick us up didn't check our luggage size and called small taxi. At the end we have to pay for additional taxi. Thanks to the friendly man who picked us up, but ill not stay in this hotel again. The staff was great and helpful, the rooms were clean and spacious, the food at the hotel was delicious, and it’s close to the airport. Stay here if you have an early flight and you don’t want to wake up really, really early. It is very ideal hotel for guest who are in transit because near to airport. No hassle. The hotel staff will arrange for transport with charges if need arises, staffs are able to provide tour service as well with good arrangement, very responsible. Although the hotel did not have lift but the staff will carry the bag on behalf. Keep it up with the good services. Sorry for you wait. But what is different with hotel photos? Can you tell us where the hotel is not exactly the same as the pictures you booked? Thank you ! It was clean and comfortable hotel. And it's very near from airport. By car it takes about 5 minutes. But you'd better make sure the date and time of pick up service. When I exchanged the message with the owner, the date and time was very clear but he didn't appear because of misunderstanding. And taxi at lste night was very dangerous and the driver didn't know how to use google map so I was so panicked. If you are looking for a cheap hotel near the airport until your flight, this hotel is suitable. The hotel in a side street and there are no restaurants in the area. The mattress is too hard but overall its a good place to crash nearby the airport for an overnight stay. The price is half of the capsule hotel in Hanoi airport, recommend to take uber / grab to this hotel which is only 5-10 mins away from the airport. If you have an early morning flight, it is one of the closest hotels near the Noi Bai airport. It is around 2.5 km away from Terminal 2. The reception will help you arrange for the taxi, although the charge will be more than the Uber / Grab. I was also told nothing was complimentary in the room, not even water and coffee powder. That was a surprise. There is no use listing out the bad aspects of the hotel as it is a budget hotel and hence expectation will have to be recalibrated. Very near the airport but you need to enter an alley to find it, skip their breakfast, not really how I want it to be, there's a bun cha/pho eatery nearby anyway. Staff very helpful and room is big, clean and has fast wifi. They said if you are in city center you can request a transfer from them to take you from city and to hotel. My taxi driver could not find the small road and missed it but luckily I had google maps and showed to the driver where to go. The room was very spacious and the wifi connection was very good. Toilet seat was clean! staff, transportation and time appointment. Their staff have very good service mind, and welcome us. 4 times as we appointed to pick up. They were on time and make us easy to plan in our trip. Room so clean and comfort enough. I am not native English but try to make the explanation. The staff at the hotel were very warm and helpful, arranging for transport into the city and back to the hotel using their personal vehicles. Rooms and beds were clean and big enough, and provided enough comfort for a night. The hotel was strategically located walking distance from the airport- I actually walked there from the airport and had no issues finding the place. While it is not the best or cleanest, it does the job well for its price. Good place for a simple layover. What do you need on a long layover? Clean inexpensive room, friendly staff and proximity to the airport. Family Transit got it all. Given the choice between 7-hour and 18-hour layovers we chose 18 hours and didn't regret it a bit. Noi Bai's new terminal, while new is still terrible and inconvenient, so rather than spending 7 hours there, we got to the hotel, got their cab service to drive us to Hanoi for nice dinner and a walkabout and got back to have a solid night of sleep before boarding the plane. Very friendly and attentive staff, really close to Noi Bai's new Terminal. Note: Taxi drivers at Noi Bai will hate your guts for such a short ride (it's less than 1km from the terminal) and will try to either screw you for money or just dump you on the side of the road. They DO get aggressive. So make sure to request a transfer service to the hotel. I was flying back through Hanoi on my way home (Seoul) after traveling through SE Asia. Without the time to go into the city, this hotel was a great spot for the night. I was met at the airport, and from gate to check-in took ten minutes. The hotel and room were clean, and the bed was very firm (in Asian style, which I prefer). They have food available, but I opted to walk down the street and hit a nearby restaurant. I slept well, even when a raging summer thunderstorm knocked the power out temporarily (the hotel has a generator, so it wasn't a big problem). The staff were the best part about this hotel. Warm and friendly, with some English ability (one employee was very good). The best part of my stay was when they asked me if I wanted a taxi or to ride one of their motorbikes to the airport in the morning. I've never had that option in my life, and as a motorcyclist I was thrilled. It was the best drive to the airport I've ever had (but take a taxi if you've never ridden in Vietnam before). I would stay here again if I need to be at the airport early. 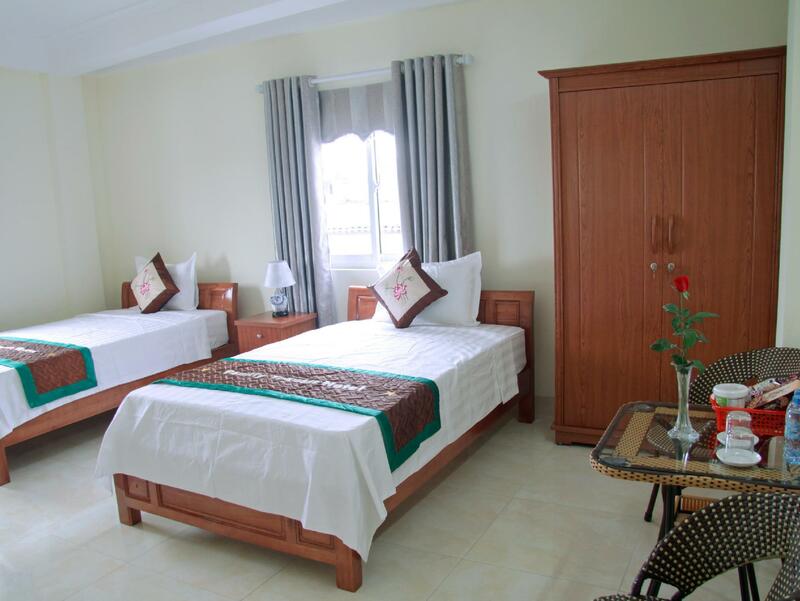 It is highly recommended as the transit hotel near Hanoi airport. They got Free transfer service FROM the airport. The room is spacious, food is cheap and the staffs can communicate well using English. We appreciate for the help and quick response!